The guest house is about 2.5km from the centre of Tirupati. It is on the edge of the town and near the edge of the campus. 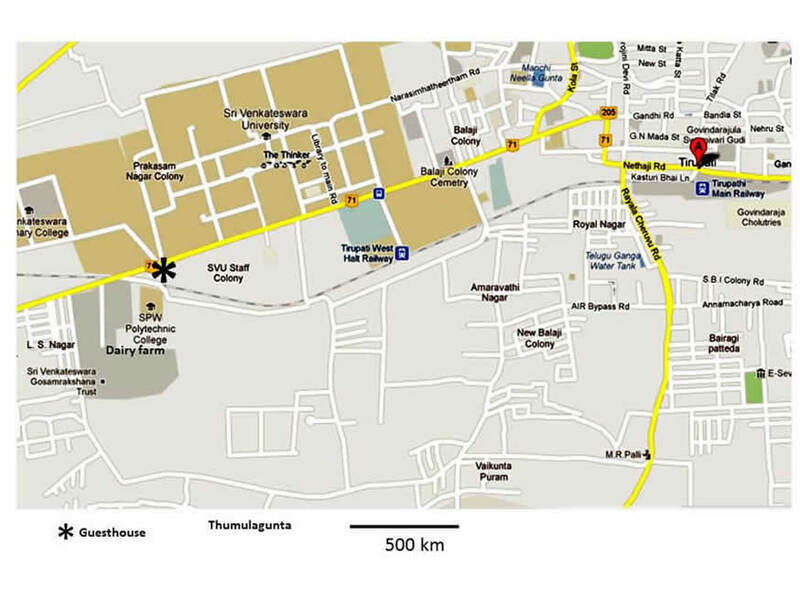 Opposite the Guest house are small roads leading into the campus or up to NCC Nagar and then out towards the forest. If the road is taken West towards Chittoor / Bangalore, past the railway level crossing there is the entrance to the large dairy farm run by and for the TTD (Tirupat, Tirumula Devsthanams), the temple administrators. It is very peaceful and good for birds. Just past the dairy farm is the road to the left that leads to Thumulagunta. After Thumulagunta a right turn goes past Upurapalli to Upurapalli Checkpoint on the bypass road. On the far side there is then a small track that continues South into the sort of rural area typical of the surroundings of the guest house 30 years ago when i first went there. The start of most morning walks up toward NCC Nagar. On the edge of the horse excercise ground where the hoopoes are often seen. Name of tree please? These pictures are taken South of Thumulagunta and the bypass road beyong Uparapalli. This is what the whole area around Thumulagunta was like before the spread of big new houses and 4 lane roads.